Welcome to the Bryn Meadow Farm. 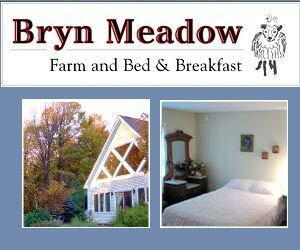 The Bryn Meadow Bed and Breakfast is located on a sustainable, natural, humane farm that raises free-range animals. Centrally located for boating, fishing, skiing, shopping, universities and museums. The Shelburne Museum, a world class museum, and Shelburne Farms are 10 minutes away. VAST (snowmobile) trailheads are 3 minutes down the road. We are about 20 minutes from downtown Burlington & UVM, approximately 30 minutes to Middlebury & the College. The famous Vermont Mozart festival takes place only 10 short minutes away as well as the Vermont Teddy Bear Factory. A highly recommended Vermont farm bed and breakfast. Ask us about the Byrn Meadow Bed and Breakfast. If you would like to feature your Champlain Valley Vermont Country Inn, Lodge or Bed Breakfast Inn to this web site, please contact us.